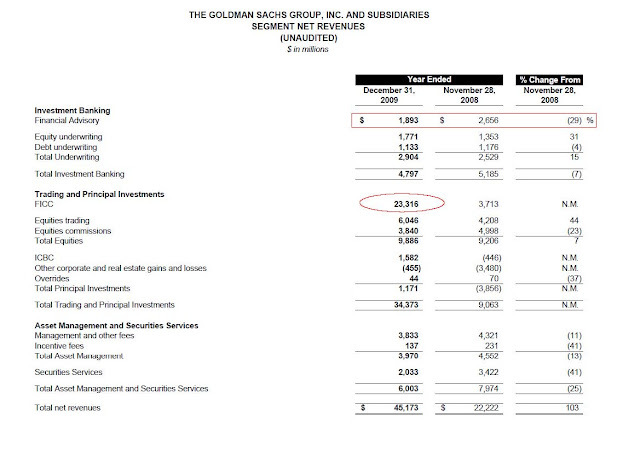 Earlier this morning, Goldman Sachs reported q4 2009 earnings of $8.20 per share, versus the expected $5.20. Shares are up about 1% in premarket trading. The improvement in full year 2009 results goes back a few quarters, when FICC (Fixed Income, Currency & Commodities) was going absolutely nuts thanks to government involvement. Still, this was a great quarter and a great year for the firm. In the earnings release, Goldman cites the lowest compensation ratio in its history as a public company, seeking to soothe the populist anger being whipped up so well by politicians.